• How many more Americans would travel to Cuba for overnight stay if U.S. travel restrictions were lifted? • What would be the resulting net increase in passenger demand for travel on U.S. air carriers (i.e., excluding travel diverted from other destinations)? • How much additional economic activity would the increased demand for air travel generate? • How many passengers would visit Cuba on U.S.- based cruise ships, and how much additional economic activity would that generate? Our analysis focused on airline and cruise travel because increased transportation demand is the most direct way in which a decision to lift travel restrictions would affect the U.S. economy. We used our estimate of the direct increase in transportation demand to calculate the broader impact on the economy that lifting restrictions would have. This overall impact also includes “indirect” effects (i.e., increased demand for labor, equipment, and other inputs to travel) and “induced” effects (i.e., consumer spending by employees of airlines, cruise lines and their suppliers). We examined, but did not attempt to quantify, other economic effects of lifting travel restrictions, including inland travel and the “consumer surplus” benefits of giving Americans another travel option. In conducting our analysis, we looked at the longterm economic impact of lifting the travel ban, rather than the impact in the first few years. Thus, we disregarded any near-term constraints in the supply of hotel rooms and other tourist infrastructure in Cuba, in the belief that supply would increase to meet demand over the long term. Similarly, we assumed that over time, Cuba would provide effectively unrestricted access to U.S. airlines in an effort to attract American travelers. Finally, we made two assumptions about the scope of potential legislation. First, we assumed that elimination of the travel ban would not only allow Americans to go to Cuba but also enable U.S. companies to transport them there. Second, we assumed that the broader trade embargo against Cuba would remain in place. Restrictions on travel have been a key component of U.S. policy toward Cuba for most of the last 40 years.1 In 1962, President Kennedy imposed a trade embargo on Cuba to punish the new Communist regime of Fidel Castro. A year later, the Department of the Treasury’s Office of Foreign Assets Control (OFAC) issued comprehensive regulations to carry out the embargo. Although OFAC regulations did not ban travel itself, they placed restrictions on any financial transactions related to it, effectively banning travel. OFAC’s regulations have changed many times since 1963. In 1977, President Carter lifted the ban on travel to Cuba altogether. Five years later, President Reagan reimposed restrictions on tourist and business travel but allowed continued travel by Cuban Americans visiting close relatives. President Clinton made repeated changes to the OFAC regulations in response to actions by the Cuban government. For example, after suspending flights between Cuba and the United States in 1996, Clinton in 1998 allowed resumption of charter flights from Miami to Havana, and in 1999 announced a new policy permitting direct flights to Cuba from New York and Los Angeles as well. Most of the travel done under a general license consists of family visits by Cuban Americans. Specifically, U.S. residents with close relatives in Cuba can visit once every 12 months under self-defined circumstances of “humanitarian need,” such as a sick or dying relative. (From 1994 to 1999, OFAC required “extreme humanitarian need.”) Others who can travel under a general license include scientists, academics and researchers; fulltime journalists employed by a news organization; U.S. government officials; and non-professional athletes participating in international competitions. Individuals who may be eligible for specific licenses include free-lance journalists, students, and business travelers arranging permitted export sales (medicine, medical equipment, and agricultural equipment and products to non-profit entities). In addition, Cuban Americans visiting close relatives for humanitarian reasons can apply to travel more than once a year. Although OFAC grants specific licenses on a case-bycase basis, an individual license may authorize more than one traveler (e.g., an entire family or the staff of a research institution) and multiple trips over an extended period of time. Because of the nature of its licensing process (i.e., general licenses require no written approval and specific licenses can cover multiple travelers and trips), OFAC lacks precise data on how many Americans visit Cuba each year. However, the agency does track the number of Americans who travel to Cuba on (OFAC-licensed) charter flights, the only means of direct air transport from the United States. In addition, OFAC estimates the number of Americans who travel legally to Cuba (i.e., under a general or specific license) via a third country. During 2000, the last year for which it has done an analysis, OFAC estimates that 156,000 Americans traveled to Cuba legally.3 That is nearly double the figure for 1999 (82,000), presumably reflecting the Clinton Administration’s “people-to-people” initiative. Most of those travelers—70 percent or more, according to OFAC’s estimate—were Cuban Americans visiting close relatives. The vast majority of them (135,000) traveled to Cuba on direct charter flights; the rest went via a third country. Question 1: How Many More Americans Would Travel to Cuba for Overnight Stay if Travel Restrictions Were Lifted? The USITC’s cautious estimate reflects, in part, an assumption that “the Cuban Government is not likely to grant visas in large numbers to U.S. residents with family ties to Cuba, because the Government could receive higher revenues and returns on investments from expenditures by tourists.”11 However, there is no apparent reason why Cuba would not grant entry to both American tourists and Cuban Americans. Stated differently, contrary to the USITC’s assumption, there is no constraint that would force Cuba to favor tourists over Cuban American visitors; even a shortage of hotel rooms should not produce that result, since Cuban Americans typically stay with relatives. Personal Travel: Personal travel refers to “family visits,” or what travel professionals call VFRs (“visits to friends and relatives”). The 120,000 Cuban Americans who traveled to Cuba in 2001, as reported by Cuban Foreign Minister Pérez Roque, represented about 10 percent of the 1.2 million Cuban Americans living in the United States.15 Because Cuban Americans can return to Cuba once a year without written approval, one might argue that lifting travel restrictions altogether would have little effect. But the spike in travel following OFAC’s 1999 policy changes suggests that more Cuban Americans would visit Cuba if there were no restrictions. The annual rate of return visits to the Dominican Republic by Dominican Americans appears to be quite high—40-45 percent, according to an unofficial estimate by the Dominican Tourism Ministry based on data on airport arrivals by Dominican nonresidents. 18 Dominican experts living in the United States confirm that Dominican Americans return in large numbers to see friends and family in the Dominican Republic. On balance, the 40-45 percent annual VFR rate for Dominican Americans is probably a reasonable predictor of the frequency with which Cuban Americans would visit Cuba absent the travel ban. However, to be conservative, we used a 33 percent rate as the basis for our subsequent calculations. At that rate, Cuban Americans would make 409,000 annual visits to Cuba—289,000 more than the current estimate of 120,000. Recreational Travel: Existing estimates of the number of Americans tourists who would travel to Cuba absent travel restrictions rely on several predictive techniques. One approach is to examine how many Americans go to comparable Caribbean destinations such as Puerto Rico or Cancun. Another approach is to generalize from historical data—e.g., by assuming that the same fraction of American tourists to the Caribbean who went to Cuba in the 1950s would do so in the future. A third approach is to estimate total tourist arrivals in Cuba and then to allocate some share of those arrivals to American tourists. Although any technique for estimating American tourist travel to Cuba is necessarily subjective, the more direct the basis for the forecast, the better. As with personal travel, to base our estimate of tourist travel on the most direct comparison possible, we looked at groups that are like Americans in all respects except their ability to travel freely to Cuba. Canadians travel to Cuba for recreation at a surprisingly high rate. In 2000, 308,000 Canadian tourists visited Cuba.25 That represents 25 percent of all Canadians who went to the Caribbean that year and nearly one in every hundred Canadians. The closest competitor as a destination for Canadians is the Dominican Republic. In 2000, the Dominican Republic attracted 246,000 Canadians—20 percent of all those who traveled to the Caribbean. Because of the similarity between the two groups, the frequency with which Canadians travel to Cuba for recreation is likely to be the best predictor of the frequency with which Americans would do the same. If American tourists were to visit Cuba at the same rate as Canadians, 2.80 million Americans would travel there annually.26 That is 2.72 million more than the number of Americans (excluding Cuban Americans) who visited Cuba in 2001.
Business Travel: According to the U.S.-Cuba Trade and Economic Council, 3,700 U.S. business representatives visited Cuba in 2001, up sharply from 500 in 1994.27 If the United States were to lift all restrictions on trade with Cuba, business travel would no doubt skyrocket. But lifting travel restrictions while leaving the trade embargo in place may not have a significant effect on business travel. For purposes of our analysis, we assumed there would be no increase in the number of business visits to Cuba if restrictions were lifted. Summary: Although any estimation technique is subjective, the travel patterns of closely comparable groups provide the most direct basis for predicting how Americans would behave absent travel restrictions. Table 1 summarizes our estimates. Based on our examination of the rate at which Dominican Americans visit the Dominican Republic (40-45 percent), we estimate that at least 409,000 Cuban Americans (33 percent) would visit Cuba annually for personal reasons—289,000 more than the current number. Based on the high incidence of Canadian tourist travel to Cuba, we estimate that 2.8 million American tourists would visit there annually— 2.72 million more than the current number. In all, we estimate that 3.21 million Americans would visit Cuba annually—3.01 million more than the current number. Question 2: How Much Would Demand for U.S. Air Carriers Increase as a Result of this Additional Travel? Travel on U.S. Airlines: Step two in our analysis was to estimate how much demand for U.S. air carriers would increase as a result of this additional travel to Cuba. We focused on U.S. airlines for two reasons. First, most people travel to the Caribbean by air. In fact, national tourism statistics such as those cited throughout this paper are based on airport arrivals. Second, absent travel restrictions, most Americans flying to Cuba would use a U.S. air carrier. Thus, the most direct and potentially significant impact on the U.S. economy of lifting the travel ban would be the increased demand for U.S. airlines. To measure the value of demand for U.S. airline service, we used the price of airfare from the United States to Cuba.29 Currently, the average roundtrip fare on a direct charter flight from Miami to Havana is $329. The fare is higher for flights to Havana from New York ($599) and Los Angeles ($670), and for flights to Cuban cities other than Havana. Since most passengers fly from Miami to Havana, we used the average fare on those flights—rounded down to $300—for purposes of our analysis. Demand Diversion Versus Demand Creation: Many Americans who would travel to Cuba if the ban were lifted would otherwise travel to an alternative tourist destination. One indication is that officials from the Dominican Republic and Puerto Rico worry about Cuba “cannibalizing” tourism to their countries. Stated differently, much of the travel by Americans to Cuba would not create new, or incremental, demand for U.S. air carriers; it would merely divert travel from one tourist destination to another. This distinction between “demand diversion” and “demand creation” is critical, because the impact of lifting travel restrictions on spending is limited to that share of travel that represents a genuine expansion of the market. It would not be fair to count the value of trips to Cuba by Americans who would otherwise go to Jamaica or Cancun. Not all new trips to Cuba would represent a diversion of travel from other destinations, however. Additional family visits would be purely incremental, because the alternative for Cuban Americans would be to stay home. Moreover, some recreational travel would be market expanding. For example, some people who would otherwise stay home would travel to Cuba because of its unique characteristics. In addition, residents of South Florida would begin making incremental trips to Cuba, just as residents of Boston and Philadelphia travel to New York to attend a play or see a museum exhibit. Finally, Cuba might attract travelers who otherwise would visit a destination not served by U.S. airlines. Alternative Methods of Estimating Increased Demand: Because the distinction between demand creation and demand diversion is so important, we use two alternative methods to estimate how much the demand for U.S. airline service would increase if restrictions on travel to Cuba were lifted. The key difference between the two methods is the way they account for demand diversion. Estimation Method 1. Using the first method, we make an arbitrary assumption that 80 percent of additional tourist travel to Cuba would be demand-diverting and that only 20 percent would be demand creating. Our 80-20 assumption is an educated guess, designed to err on the side of being conservative. It is one that we would apply to any Caribbean market just opening to Americans, regardless of its popularity. Based on this conservative assumption, of the 2.72 million tourist trips to Cuba that we estimated above, only 0.544 million trips would represent incremental travel. For the reasons discussed earlier, we treat all 0.289 million of our estimated additional family visits as incremental travel. The sum of these two figures (0.833 million) is the total number of annual incremental trips that would occur absent travel restrictions. To calculate the resulting increase in demand for U.S. air carriers, we multiply the number of incremental trips (0.833 million) by the average roundtrip Miami-Cuba airfare ($300). The product, $250 million, represents the annual increase in revenues that U.S. air carriers would enjoy in the absence of restrictions on travel to Cuba. Estimation Method 2. With the second method, we estimate incremental demand for U.S. air carrier service to Cuba directly rather than indirectly. Moreover, instead of treating Cuba the same as any other new Caribbean destination, we use market-specific information—namely, the high incidence of Canadian travel to Cuba—as an important clue in developing our estimate. Specifically, we posit that the (small) difference in the rates at which Canadians and Americans travel to the Caribbean for recreation is due to the fact that Canadians have Cuba as a Caribbean travel option whereas Americans do not. The fact that one in every hundred Canadians travels to Cuba is telling. It is a sufficiently high rate to suggest that the availability of Cuba may increase overall Canadian travel to the Caribbean. Although other explanations are possible, the strong similarity in demography and tastes between Canadians and Americans cancels out many alternative explanations. Because of this strong similarity, we would expect U.S. travel activity to the Caribbean to mirror that of Canada. Stated differently, if Americans, like Canadians, were free to visit Cuba, we estimate that an additional 0.38 percent of all Americans would travel as tourists to the Caribbean. Using the current U.S. population (287 million), elimination of travel restrictions would result in 1.09 million incremental trips to Cuba by American tourists annually. This represents a 10.8 percent net increase in annual American arrivals in the Caribbean. In our judgment, this increase is a reasonable upper bound on the potential expansion of the overall air travel market as a result of lifting restrictions on travel to Cuba. The remaining steps in method 2 are identical to those of method 1. We add incremental tourist trips (1.09 million) and additional family visits by Cuban Americans (0.289 million) to get the total number of incremental trips (1.38 million). Then we multiply that figure by the average Miami-Cuba roundtrip airfare ($300). The result—$415 million—equals our second estimate of the increased revenues that U.S. air carriers would enjoy in the absence of restrictions on travel to Cuba. Summary: Table 2 summarizes our estimate of the net increase in demand for travel on U.S. air carriers absent restrictions on travel to Cuba. The key challenge is to distinguish between diverted travel and incremental, or market expanding, travel. Our first estimation method makes an educated but arbitrary guess that 80 percent of additional tourist travel to Cuba would be diverted from some other Caribbean destination and 20 percent would be incremental. Based on that method, and using our earlier forecast of additional travel to Cuba, we estimate that the increase in demand for U.S. air carriers absent travel restrictions would expand airline revenues by $250 million a year. Our second estimation method attributes the small difference between Canadian and American tourism rates to the Caribbean to the fact that Canadians have Cuba as an additional option— a reasonable explanation given the extremely high incidence of Canadian travel to Cuba and the strong similarity in travel tastes between Canadians and Americans. Assuming that the availability of Cuba would increase U.S. travel to the Caribbean by the same amount, U.S. air carriers would enjoy an increase in revenues of $415 million a year. Both estimates are plausible. Thus, in the last step of our analysis below, we will treat the two estimates as a range. Question 3: How Much Additional Economic Output and Employment Would the Increased Demand for Air Travel Generate? As the third step in our analysis, we calculated the overall increase in economic activity that would result from the incremental demand for air travel. As we saw in the last section, lifting restrictions would have the direct effect of raising the demand for U.S. airline service by a small but significant amount. This increased demand would generate two broader economic effects. First, airlines would have to purchase additional equipment, labor, travel agent services, food and beverages, and other inputs. Airline equipment suppliers in turn would have to buy more steel, machine tools, and labor; and so on. The income and jobs created by this increased demand for inputs to air travel represent “indirect” effects. Second, employees of the airlines and their supplier firms would spend a portion of their income to buy food, clothing and other consumer goods and services, and that money in turn would get spent. The income and jobs created by this repeated spending process represent “induced” effects. In sum, the initial direct increase in demand for U.S.-Cuba air travel would ripple through the economy, increasing the income of labor and capital multiplicatively. Economic Output: Economists have calculated a range of values with which to measure the multiplicative effects of a dollar of additional spending on airline services. Because air travel benefits the entire travel and tourism sector, sparks business activity near hub airports, and requires material inputs ranging from aircraft to eating utensils, its impact is larger than that of many other industries. Based on a forthcoming study by DRI-WEFA, we used a multiplier estimate of 2.6 to calculate the overall economic impact of our estimated increase in incremental demand for airline service.30 Taking our first estimate ($250 million), the overall economic impact of lifting the travel restrictions would be 2.6 times that amount, or about $650 million a year. Using our second estimate ($415 million), the overall economic impact would be about $1.08 billion a year. Table 3 summarizes these results. Employment: An alternative way to express the economic impact of increased demand for air travel to Cuba is in terms of the number of jobs that would be created in the airline industry and other sectors of the U.S. economy. This involves translating the economic impact figures cited above into employment effects. 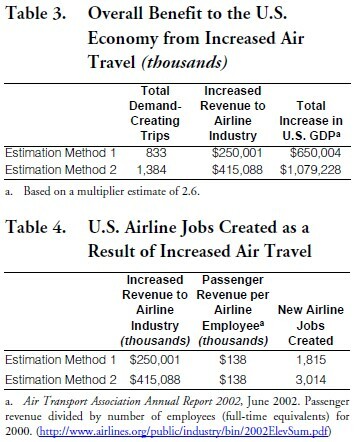 Specifically, to calculate the number of jobs that would be directly created in the airline industry, we divided our estimates of incremental annual airline revenue by the average annual revenue per employee in the airline industry ($138,000).31 As reflected in Table 4 our first estimate of annual airline revenue ($250 million) is equivalent to 1,815 new jobs in the aviation industry. Our higher estimate ($415 million) is equivalent to 3,014 new airline industry jobs. 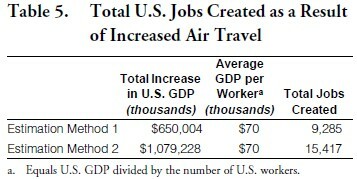 To calculate overall employment effects, we divide our estimates of the overall economic impact of increased travel demand to Cuba by the average output per employee in the U.S. economy ($70,000).32 As shown in Table 5, the overall employment effects of increased demand for air travel would range from 9,285 to 15,417 jobs created. Summary: Because air travel benefits the entire travel and tourism industry, sparks business activity near hub airports, and increases demand for a wide range of material inputs, an increase (or decrease) in airline revenue has an effect on the economy that is a multiple of the direct impact on the airline industry. Thus, if travel restrictions were lifted, the net increase in demand for service on U.S. air carriers would generate significant additional activity throughout the economy. Using a multiplier estimate of 2.6, we calculate that this activity would expand U.S. economic output by $650 million to $1.08 billion a year. The corresponding employment effects would range from 9,285 to 15,417 new jobs. Question 4: How many passengers would visit Cuba on U.S.-based cruise ships, and how much additional economic activity would that generate? Industry experts are unanimous in saying that U.S.- based cruise ships will flock to Cuba if travel restrictions are lifted. U.S.-based cruise lines dominate the Caribbean, competing for passengers who may otherwise travel to tourist destinations (e.g., the Mediterranean) dominated by foreign-based cruise lines. Thus, the addition of Cuba as a Caribbean port-of-call would enhance the competitive position of U.S.- based ships. While the typical cruise would make Cuba one stop on a longer Caribbean itinerary, industry experts expect to see some 7- and 14-day cruises devoted exclusively to circumnavigating the island. Because passengers sleep on the boat, cruise lines could play a particularly important role in the initial years following the end of U.S. restrictions, when tourist demand might exceed the supply of hotel rooms. To measure the economic impact of cruise travel to Cuba, we modified our air travel methodology in two ways. First, we did not estimate the total number of cruise passengers who would visit Cuba. Instead, we estimated directly the incremental cruise travel that would occur if U.S.-based cruises could stop in Cuba.33 Second, we focused on industry spending in the U.S. economy rather than industry revenues. Because U.S. airlines are U.S.-owned and most of their employees live in the United States, it is reasonable to assume that airline revenues would be spent largely in the U.S. economy. By contrast, because U.S.- based cruise ships are foreign owned, foreign built, and largely foreign crewed, only a share of their revenue would be spent in the United States. Net Increase in Caribbean Passengers: U.S.-based cruise operators carried a total of eight million passengers in 2000. Of those, roughly 3.67 million were passengers on Caribbean cruises.34 If restrictions were lifted, hundreds of thousands of Caribbean cruise passengers would visit Cuba, but most of them would have gone on a cruise even if Cuba had not been on the itinerary. To distinguish between diverted and incremental travel, we applied estimation method 2 from our air travel analysis. Based on the incremental difference in American and Canadian tourism rates to the Caribbean, we concluded earlier that the availability of Cuba as a travel option could lead to a 10.8 percent net expansion of American tourism to the Caribbean. Applying this estimate to Caribbean cruise traffic, we predict that 397,000 more passengers a year would take U.S.- based Caribbean cruises if Cuba were available as a port-of-call. Spending in the U.S. Economy: The U.S.-based cruise industry accounts for about $9.4 billion a year in direct spending in the U.S. economy, according to a detailed report prepared for the International Council of Cruise Lines (ICCL).35 In addition to $8 billion in industry spending, this figure includes about $1.4 billion in spending by cruise passengers on air transportation, lodging, and retail. To determine the value of a 10.8 percent increase in passenger demand for Caribbean travel, we did a three-step calculation. Second, we estimated the amount of variable spending in the U.S. economy attributable to Caribbean passengers. Caribbean cruises account for 45.9 percent of the U.S.-based industry’s passenger capacity, as measured by passenger “bed days.”38 Thus, we assumed that the amount of variable spending attributable to Caribbean passengers is 45.9 percent of $5.6 billion, or $2.59 billion a year. Third, we assumed that a 10.8 percent increase in Caribbean passenger demand would produce an equivalent increase in the U.S.-based cruise industry’s Caribbean-related variable spending. That equals $280.15 million a year. Summary: Tables 6 and 7 summarize our estimate of the economic impact of lifting restrictions on cruise travel to Cuba. Based on our earlier analysis of Cuba’s potential to expand the overall Caribbean travel market, we estimate that the elimination of travel restrictions would result in a 10.8 percent increase in demand for U.S.-based Caribbean cruises. As a direct impact, we estimate that U.S.-based cruise lines would spend an additional $280.15 million a year in the United States. The indirect and induced economic effects would equal another $252.13 million in spending, for a total increase in U.S. economic output of $532.28 million a year and about 7,603 new jobs. • Domestic Travel. To reach their point of departure, Cuba-bound passengers would engage in additional travel spending beneficial to the U.S. economy. For example, airline passengers would fly to Miami or another gateway city, and cruise passengers would fly or drive to their port of embarkation. 41 Many travelers would spend one or more nights in a hotel in the gateway or port city. • Foreign Travelers on U.S. Airlines. Foreign travelers, though not directly affected by the travel ban, might provide additional business for U.S. airlines if the ban were lifted. For example, European tourists visiting South Florida might add a trip to Cuba to their itinerary.42 And U.S. carriers with extensive European operations might pick up a small amount of business from European tourists whose sole destination is Cuba. • High-Speed Ferries. Industry experts believe that high-speed ferries could become a major transportation link to Cuba. Ferry service is popular in Europe and elsewhere, in part because passengers can take their cars and trucks on the boat. Although the economic benefits could be significant, the prospect remains too speculative to quantify at this point. • Market Growth. Our estimates, based on recent data, do not account for the potential growth over time in travel to Cuba. As one indication, American tourist arrivals in the Caribbean grew by 37 percent from 1990 to 2000.43 Similarly, U.S.-based cruise lines doubled their Caribbean capacity from 1990 to 2000.44 Tourism aside, the U.S. government admits a minimum of 20,000 Cubans for permanent residency each year, and these recent emigrants are a likely source of growth in personal travel to Cuba. • Consumer Surplus. In addition to the benefits to American industry, lifting travel restrictions would bring significant benefits to American tourists, by giving them a broader choice of travel destinations. Some travelers would prefer Cuba to their current best travel option. For such travelers, the ability to go to Cuba would be a significant source of value—one that we did not attempt to measure. Elimination of restrictions on travel to Cuba would have a noticeable impact on the U.S. economy, assuming that U.S. companies were allowed to transport Americans to Cuba. The U.S. airline and U.S.- based cruise industries would benefit most directly, but other sectors would benefit as well because of the broad impact of increased travel demand on the U.S. economy. To summarize, we estimate that an additional 3.01 million Americans would travel to Cuba annually on U.S. air carriers in the absence of travel restrictions. Of those, 2.72 million would be tourists and 289,000 would be Cuban Americans visiting friends and relatives. Excluding travel diverted from other destinations, U.S. airlines would earn from $250 million to $415 million a year in increased revenue as a result of this added demand. Overall, the increased demand for air travel would expand U.S. economic output by $650 million to $1.08 billion a year and create 9,285 to 15,417 new jobs. For the U.S.-based cruise industry, we estimate that elimination of travel restrictions to Cuba would lead to a 10.8 percent net increase in demand for Caribbean cruises. To meet this demand, U.S.-based cruise lines would spend an additional $280.15 million annually in the United States. Overall, this increased demand for cruise travel would expand U.S. economic output by $532.28 million annually and create 7,603 new jobs. Looking at the total impact of lifting travel restrictions (Table 8), measured as the combined impact of increased air and cruise travel, our estimates indicate that U.S. economic output would expand annually by $1.18 billion to $1.61 billion. This expansion would create 16,888 to 23,020 new jobs. 1. For a detailed discussion of this issue, see Congressional Research Service Report RL31139, Cuba: U.S. Restrictions on Travel and Legislative Initiatives in the 107th Congress, by Mark P. Sullivan, updated March 27, 2002. Available under “Long Reports” at http:// www.house.gov/markgreen/crs.htm. 2. See Prepared Statement of R. Richard Newcomb, “Restrictions on Travel to Cuba,” Hearing Before the Senate Appropriations Subcommittee on Treasury and General Government, February 11, 2002, pp. 40-44. 3. Telephone interview with senior OFAC official, May 2002. Although OFAC does not issue formal statistics on travel to Cuba, the agency compiled the figures cited in this paragraph in preparation for a recent congressional hearing. 4. “Restrictions on Travel to Cuba,” op. cit., p. 52. Thus, using OFAC’s estimate of 156,000 legal visitors, the number of Americans who traveled to Cuba in 2000 could be as high as 234,000. At the same hearing, Newcomb responded positively when asked if the number of Americans who visited Cuba in 2001 was “between 150,000 to 200,000,” but he may have been referring just to those who traveled there legally. 5. The Cuban government does not recognize dual citizenship; specifically, any Cuban-born American citizen who left Cuba after 1970 is considered to be solely a Cuban citizen. Hence Cuba classifies most Cuban Americans who visit Cuba as “U.S. residents,” rather than “U.S. citizens,” because it still considers them Cuban citizens. 6. “U.S. Travel Association Eyes Forbidden Cuba,” Reuters, April 6, 2002. 8. U.S. International Trade Commission, The Economic Impact of U.S. Sanctions With Respect to Cuba, Publication 3398, February 2001. Available at: http://www.usitc.gov/wais/reports/arc/w3398.htm. 9. Mary Murray, “Cuba Ban Said to Hinder Travel Agents,” MSNBC, April 6, 2002. ASTA included the same estimate as part of its written submission to the ITC study cited above (see p. D-31). 10. Ed Sanders and Patrick Long, “Economic Benefits to the United States from Lifting the Ban on Travel to Cuba,” Center for Sustainable Tourism, Leeds School of Business, University of Colorado, June 2002. Available at: http://www.cubapolicyfoundation.org/ pdf/CubaTravel.htm. 11. U.S. International Trade Commission, op. cit., page 4-21. 12. Telephone interviews with USITC staff, May 2002. 13. Ernest H. Preeg, Feeling Good or Doing Good with Sanctions: Unilateral Economic Sanctions and the U.S. National Interest, Center for Strategic and International Studies, Washington, D.C., 1999. 14. National statistical agencies treat any foreign visitor who stays overnight as a “tourist,” even if the visit is for personal or business reasons. Because cruise passengers typically do not stay overnight, they are classified as “excursionists” rather than “tourists.” We use “travel” in this section to refer to overnight visits, but in keeping with conventional usage, we reserve the term “tourist” for a recreational traveler. 16. The 2000 census reported 912,501 Dominican Americans living in the United States. U.S. Census Bureau, op. cit., Table PCT006. 17. In 1999, foreign-born Cuban Americans totaled nine percent of the Cuban population; for Dominican Americans, the comparable figure was eight percent. Susan Eckstein, “Dollarization and its Discontents: Remittances and the Remaking of Cuba in the Post-Soviet Era,” unpublished paper, May 2002. 18. Airport arrivals by non-resident Dominicans totaled 512,966 in 2000 and 483,682 in 2001. Central Bank of the Dominican Republic, Economic and Financial Information, Tourism Sector, Tables on “Arrival of Passengers by Nationality” for 2000 and 2001. Although published statistics do not specify the country of residence, the Ministry of Tourism estimates that 75-80 percent of nonresident Dominican arrivals live in the United States. Gustavo Ricart, Analyst, Ministry of Tourism, personal communication, June 2002. 19. About 43 percent of foreign-born Cuban Americans emigrated to the United States from 1980 to 2000. For Dominican Americans, the comparable figure is 70 percent (with 44 percent of all Dominican Americans admitted between 1988 and 1998). Max J. Castro and Thomas D. Boswell, “The Dominican Diaspora Revisited: Dominicans and Dominican-Americans in a New Century,” Dante B. Fascell North-South Center, University of Miami, Paper No. 53, January 2002, pp. 1 and 21. 20. Susan Eckstein and Lorena Barberia, “Cuban-American Cuba Visits: Public Policy, Private Practices,” Report of the Mellon-MIT Inter-University Program on Non-Governmental Organizations and Forced Migration, Center for International Studies, Massachusetts Institute of Technology, January 2001. Available at: http://web.mit.edu/cis/www/migration/eckbar.PDF. 21. Eckstein and Barberia, p.17. The Cuban government has dropped other costly requirements (e.g., Cuban Americans previously had to book a hotel room, even if they were hosted by a Cuban family). 22. U.S. Census Bureau, op. cit., Table PCT006. 23. Castro and Boswell, op. cit., Table 4, p. 18. 26. To get this figure, we multiplied the rate at which Canadians went to Cuba for tourism in 2000 (0.97 percent) times the current U.S. population (287 million). 27. U.S.-Cuba Trade and Economic Council, Inc., “Realities of Market Cuba,” p. 2. Available at: http://www.cubatrade.org/market. html. 28. Cuba’s treatment of Spain, which accounts for a significant share of tourism to Cuba, may provide a relevant example. The air services agreement between the two countries provides for reciprocal rights for their respective airlines. In practice, however, Spain’s flagship carrier, Iberia, operates many more flights between Cuba and Spain than its Cuban counterpart. The Cuban government affords effectively open access to Iberia and other Spanish airlines, presumably because of the priority Cuba places on tourism. Personal communication with officials of Iberia Airlines, July 2002. 30. DRI-WEFA, The National Economic Impact of Civil Aviation, forthcoming. The Bureau of Economic Analysis (BEA), in its inputoutput accounts, derives an output “multiplier” for air transportation of 1.84 (Table 5: Industry-by-Commodity Multipliers) to 1.92 (Table 4: Commodity-by-Commodity Multipliers). BEA, Survey of Current Business, Annual Input-Output Accounts of the U.S. Economy, 1996, January 2000, pp. 73-86. However, this multiplier is “conservative” because BEA is looking only at how increased aviation spending affects national output. BEA does not include induced effects that occur as increased income ripples through the economy in the form of increased spending. 31. According to the Air Transport Association (ATA), in 2000, U.S. airlines had passenger revenues of $93.62 billion and employed 679,967 full-time equivalent (FTE) workers. Thus, the average revenue per FTE was $137,686. ATA Annual Report 2002 (June 2002). Available at: http://www.airlines.org/public/industry/bin/20002ElevSum.pdf. 32. This figure is equal to the U.S. gross domestic product (GDP) for 2000 divided by the number of workers in the U.S. economy in the same year. Economic Report of the President, U.S. Government Printing Office, February 2002, Tables B-1 and B-35. 33. Our analysis of air travel focused exclusively on American travelers, on the theory that foreign travelers currently are free to fly to Cuba on foreign air carriers. By contrast, our analysis of cruise travel includes American and foreign passengers alike. Very few foreignbased cruise lines offer Cuba as a port-of-call due to their distance from the island; hence foreigners might well visit Cuba on U.S.-based cruises in the absence of travel restrictions. Almost 18 percent of passengers on U.S.-based cruises live outside of the United States. Business Research & Economic Advisors (BREA), The Contribution of the North American Cruise Industry to the U.S. Economy in 2000, October 2001, p. 12. 34. The U.S.-based cruise industry does not publish a breakdown of actual passengers by cruise destination. However, it does publish data on industry capacity by cruise destination. Our estimate of Caribbean passengers represents 45.9 percent of total passengers, which is the share of the U.S.-based cruise industry’s total capacity (measured in passenger “bed days”) that is devoted to Caribbean cruises. 35. BREA, op. cit., Table 10, p. 34. This report covers passenger cruise lines that primarily market their cruises in North America. We treat these cruise lines as synonymous with the U.S.-based cruise industry. 36. We also excluded spending by the cruise industry on air transportation to bring passengers to the port-of-embarkation so as to be consistent with our analysis of air travel. 37. BREA, op. cit., pp. 33-37. 38. Ibid., Table 5, p. 19. 39. Ibid., Table 12, p. 40. 40. To arrive at this estimate, we used average GDP per worker in the U.S. economy, as described in footnote 32 above. We did not calculate employment effects separately for the cruise industry, as we did with air travel, since so much of the cruise industry’s U.S. spending is for non-labor items. 41. Cruise passengers who fly to their port-of-embarkation have an average roundtrip airfare of $450. BREA, op. cit., p. 35. 42. According to 1999 Statistical Yearbook of the Immigration and Naturalization Service (Table 39), nearly 1.8 million European travelers arrived at the Miami and Orlando airports in 1999. 43. According to the Caribbean Tourism Organization, American arrivals in the Caribbean in 1990 totaled 7.35 million. 44. BREA, op. cit., p. 20.